You found our secret nest. Yes, we are the ninjas behind ranking quite a couple of local SMES into the top 5 spot for their industries that you might know of, as indicated below. Due to business confidentiality reasons, we are only able to show you selected portfolios. For each industry, we prefer to work behind the scenes long term, and are extremely selective towards who we want to help, because we take in ONLY a maximum of 2 clients to avoid competing against ourselves. We Successfully Nailed Top 5 Spot For The Following Industries. Competition as indicated. Top 5 position for most keywords relating to homeopathic clinics and doctors. Top 3 for [Music Lessons Singapore] [Music Classes Singapore] and more..
Top 3 for [Drums Lessons Singapore] [Guitar Lessons Singapore] and more..
Top 7 for [Computer Repair Singapore] [Laptop Repair Singapore]. Rank 1 for [Pre-Wedding Photography]. Top 5 for related. Below are 2 selected case studies where we optimize exclusively for the past 4 years. This means if you are in the BBQ or Wedding industry, unfortunately, we can’t serve you due to an exclusive contract we have with them. Certain business data are omitted due to confidentiality reasons. We can only show you the SEO portions. From nowhere to be found on page 1 to 7 on the Google Search Engine, EZB has seen a 400% increase in organic web traffic - ranking first for more than 70 over BBQ keywords. Established in 2004, EZB Pte Ltd today is the Number 1 BBQ wholesale and catering company in Singapore that delivers great tasting quality marinated barbecue food. Originally a local home brand without much Internet presence, EZB relies heavily on a loyal and recurring fan base. With the increase in strong market competition that affects sales margin, EZ BBQ managing director, Daniel Tay was looking to establish a secondary sales channel through online sales. 33 Digital was offered the opportunity to strategise a 1-year online strategy to grow and penetrate the online marketplace. The foremost step we did was to resolve their domain ownership arising from conflicting issues with previous vendors. This is essential to give us full control over the process. Following, we did a thorough keyword research and competitive analysis. We discovered that EZB was nowhere to be found on the first 5 to 7 pages of the search results pages for the relevant keywords. Our network analysis had shown that EZ BBQ was mentioned over hundreds of thousands of web pages indexed by Google over the past 10 years. However, due to a lack of recent and fresh brand mentions online and backlinks, EZ BBQ’s rankings in Google suffered. To build a fresh wave of inbound backlinks and brand mentions, we outreach to targeted customers’ blogs to review EZ BBQ’s catering service and updated their contact information on local business directories that list EZ BBQ website. 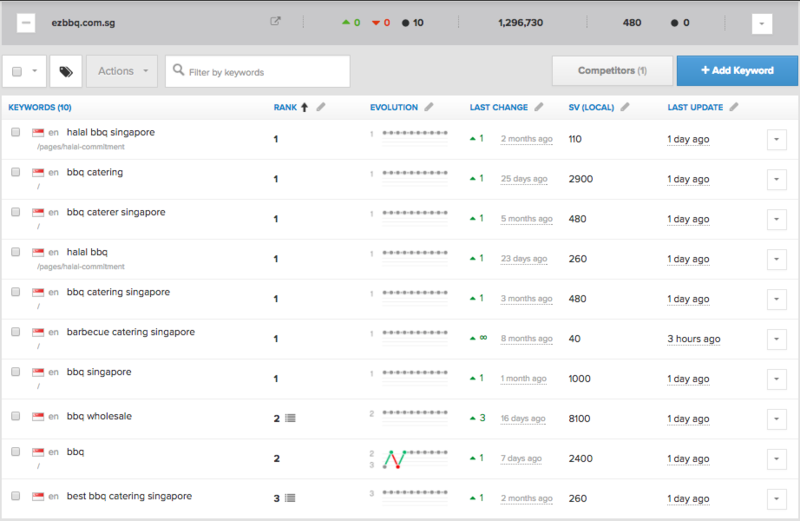 We also implemented keyword optimisation for long tail keywords. 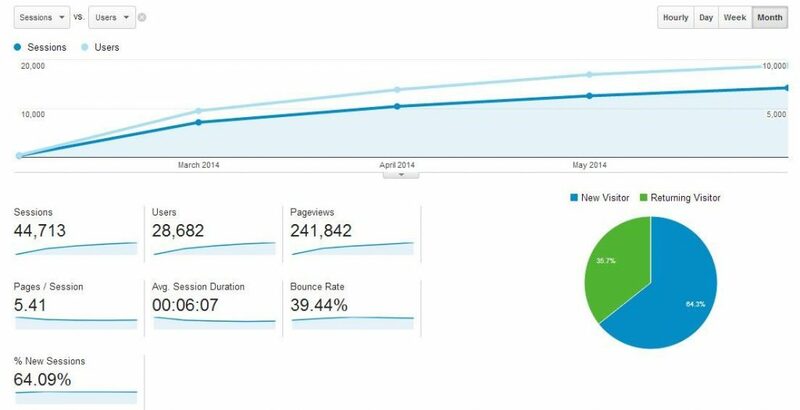 Integrating with Google Analytics and Google Webmaster Tools, we constantly tracked and reviewed the performance of our search campaign monthly to ensure we stay consistent with our search objectives. After approximately 3 weeks prior the launch of SEO campaign, EZB website went from virtually nowhere to ranking on the first page of Google search engine. Today, they have grown from an initial average of 3,000 site visits to more than 20,000 site visits every month. Sales for EZB used to come from 90% referrals and word of mouth. With the significant increase in traffic from our Search campaign, our client reported that online orders for their BBQ catering services began to climb steeply from the second month onwards. Today, 60% of their sales are from new customers online and will continue to rise in the future. Their brand popularity has grown by 250%, so much that their management has expanded its manpower and logistics infrastructure to accommodate its increased sales. From nowhere to be found in the first 10 pages of search results on Google for target keywords, Dream Wedding has significantly improved its page rankings to Page 1 with a 500% growth in organic web traffic in less than 1 year. As one of leading wedding planner and organiser based in Singapore, Dream Wedding relied mostly on networking and business referrals. As Dream Wedding has negligible to no visibility on Google search results, they were seeking to improve their website rankings in Google to Page 1 in a year, especially for competitive keywords. Firstly, we did a thorough keyword research and competitive analysis to determine the relevant keywords we want to target for their website to rank on the first page in Google. The keywords need to have significant monthly search volume. Using the target keywords as the basis, we optimised the content and structure of the website so that the pages are focused on those keywords. 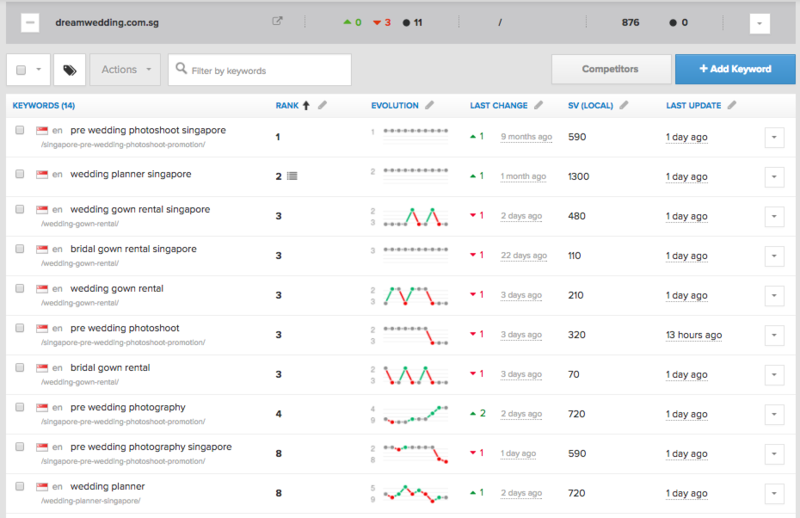 We optimised the meta tags, headlines, and content so that the keyword density is at the right level. We built content off-site, syndicating content on various platforms and sources, submitted to various link directories and guest wrote on relevant blogs to build a positive link profile for Dream Wedding. We achieved several competitive keywords on Page 1 for Google search results, such as “wedding gown rental Singapore”, and “wedding planner Singapore”. The journey to page 1 on Google search results took approximately 6 months. Organic traffic contributed to a massive growth in overall traffic, with over 500% within a span of a couple of months in 2015. As a result of the high rankings and the subsequent traffic from Google, 30 – 50 leads were generated through organic traffic every month, effectively growing their client base from month to month.